“During the war, as many babies died in Australia as did men on the battlefield”. Our Babies, p.27. In the early twentieth century there was an increase in the awareness of the well being of babies and young children. In New South Wales this concern manifested itself in the establishment of baby health clinics throughout the State. In fact, NSW was the first region in the southern hemisphere to establish a network of infant welfare clinics. In the 1880s NSW had an infant mortality rate higher than that of London. For every 1000 children born 900 would survive to one year and then approximately 800 would survive to five years old. The causes of this high infant mortality rate were diarrhoea, perinatal conditions, infectious diseases and respiratory conditions. Many of the causes of this high infant mortality rate were a direct consequence of bad housing conditions, contaminated drinking water and a lack of sanitation. The photos of The Rocks in Sydney, taken during the bubonic plague outbreak in 1900, provide a glimpse of what the living conditions in Sydney were like. The beginnings of the twentieth century saw a shift in the focus of welfare groups from the plight of the abandoned or illegitimate child to focusing on growing healthy children. The Benevolent Society opened the Royal Hospital for Women in Paddington in 1905 and as part of their outpatient services included a Consultation for Infants program. In Sydney the Alice Rawson School for Mothers, a voluntary subsidized agency, was established in 1908 with a clinic operating at Bourke St, Darlinghurst. The School was open every afternoon for consultations and also undertook home visits. Mothers leaving Alexandria Baby Clinic, Dec 1914. From NRS 4481 ST5639P. Waiting to see doctor at Alexandria Baby Clinic, Dec 1914. From NRS 4481 ST5640P. Mothers Day at Glebe Baby Clinic, 1916. From NRS 4481 MS3899P. Exterior of Bourke St Baby Clinic, Dec 1914. From NRS 4481 ST5636P. St Peters Baby Clinic, 1916. From NRS 4481 MS3892P. Official opening of Mascot Baby Clinic, 25 Jan 1916. From NRS 4481 MS3719P. On 17 June 1914, the newly appointed Minister of Public Health, Frederick Flowers, convened a conference in Sydney to discuss the expansion of the work undertaken by the Alice Rawson School for Mothers with Government backing and funding. The conference was attended by the Department of Public Health, the Department of Public Instruction, the Sydney District Nursing Association and the Alice Rawson School for Mothers. At the conclusion of the conference Flowers announced the decision to establish baby clinics in suitable districts around Sydney [Fig. 2]. 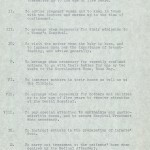 The Baby Clinics, Pre-maternity and Home Nursing Board (I) was established in July 1914. It was a non-statutory body that oversaw the Baby Health Clinics. The first government run clinic to open was at Alexandria at 22 Henderson Rd on 24 August 1914. This clinic was formerly operated by the Alice Rawson School for Mothers. The purpose of the clinic was to address the high infant mortality rate, to promote hygiene and to advance the health of women who could not afford the cost of attending a general practitioner or hospital [Fig. 4]. The Clinic was staffed by two nurses, one to visit mothers in their own homes (known as ‘outdoor work’) and the other nurse to see the babies and children brought into the clinic [Fig. 1]. The Head Nurse at the Alexandria Baby Health Clinic was Edith Pike and she was paid £135 per annum. The full list of baby clinic objectives can be seen above in the documents above. Other clinics quickly opened at Newtown, Bourke St, Woolloomooloo and Balmain and plans were underway to open new clinics in North Sydney, Glebe and Newcastle in 1915. The outbreak of the War and the restrictions on the Government budget led to conflict with the Board, who resigned after just one year of operation. 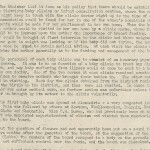 The Baby Clinics, Pre-maternity and Home Nursing Board (II) was established in August 1915. The Board appointed Lucy Spencer as a Nurse Inspector to visit and report on the baby health clinics. From 1915 to 1916 six baby clinics operated in Sydney at Balmain, Alexandria, Chippendale, North Sydney, Glebe and Miller’s Point, along with daily clinics at the Lady Edeline Hospital for Babies. Across the six clinics, there were on average 17.5 visits per day, with Balmain being the busiest clinic [Fig. 5]. 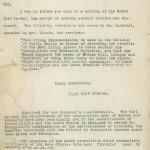 On 30 April 1917 the Board recommended to the Minister that country baby clinics be added to those operating in Sydney and Newcastle [Fig. 3]. Broken Hill, Lithgow and Maitland were proposed by the Board and in October 1918 a Baby Clinic opened in Broken Hill. By September 1919, when the Board was abolished, the number of baby clinics had increased from nine to 28. Lady Edeline Home for Sick Babies (Greycliffe), Vaucluse, no date. From NRS 4346. Over time, the success of these government run baby clinics can be gauged from the gradual decrease in the infant mortality rate over the twentieth century. Better housing, better sanitation and education about feeding and looking after infants also helped. The NSW Government initiated other schemes to grow healthy children, including the School Travelling Hospital and the School Travelling Ophthalmic Clinic. Public playgrounds also increased in popularity. The first public playground, Lance Playground/Kindergarten at Miller’s Point, built by the Sydney Harbour Trust, opened in 1912. 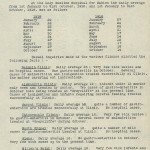 View digitised copies of two leaflets that were available at the Baby Health Clinics. New South Wales Department of Health, Our babies: the state’s best asset. A history of 75 years of baby health services in New South Wales, 1989, p.14, retrieved on 12 May 2014. Australian Institute of Health and Welfare, Mortality over the twentieth century in Australia, 2006, pp82-83, retrieved 12 May 2014. WG Armstrong, A History of the Infant Welfare Movement in Australia, (included in NRS 4876), p.4. 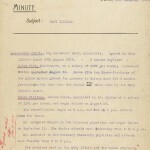 State Archives NSW; Agency 2778, Baby Clinics, Pre-Maternity and Home Nursing Board (II).